Customers at supermarket ICA Norrviken in a northern suburb of Stockholm can now view promotional deals, discounts, competitions and detailed information about products by tapping their phones against dynamic NFC tags integrated into price labels. The supermarket has also placed NFC smart posters outside its store to let customers tap to buy prepackaged grocery bags directly from their mobile device. The platform has been provided by Adfields with the aim of not only testing public reaction, but also seeing how it increases sales and enhances the effectiveness of the supermarket’s promotional activities, Adfields’ Martin Kemeny told NFC World. 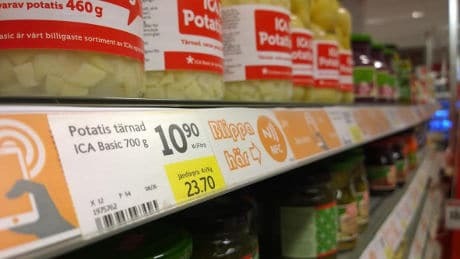 “We have installed dynamic NFC tags that are integrated with the price tags that sit on the shelves,” Kemeny explained. “300 tags have been placed in the store. Customers can get more information about the products — detailed lists of content for people with allergies, for instance. As the tags are dynamic and can be redirected, we can add promotional deals, discounts, competitions and other promotional content.